Pancakes, pikelets and crepes are relatively easy dishes for children to make over the school holidays, although my kitchen used to look like a flour and water bomb had exploded after I let my son loose in there when he was young. The occasional messy kitchen is a small price to pay to achieve offspring who are competent preparing food. Place flour and caster sugar in a large jug, making a well in the centre. Add eggs, milk, melted butter, vanilla and salt into the well and whisk together, gradually incorporating the flour. A rotary hand mixer is always fun for kids, otherwise use a balloon whisk or a wooden spoon. Cover and refrigerate for 20 minutes. Heat a non-stick frying pan over medium heat. Grease lightly with a little butter and wipe gently with a paper towel. Pour about 1/4 cup of batter into the centre of the pan; rotate and tilt to spread the batter and cover the base of the pan. Cook until top of crepe appears dry (about a minute); carefully turn with a spatula and cook another 15-20 seconds. Remove to a wire rack and continue with remaining batter, greasing pan lightly as needed. 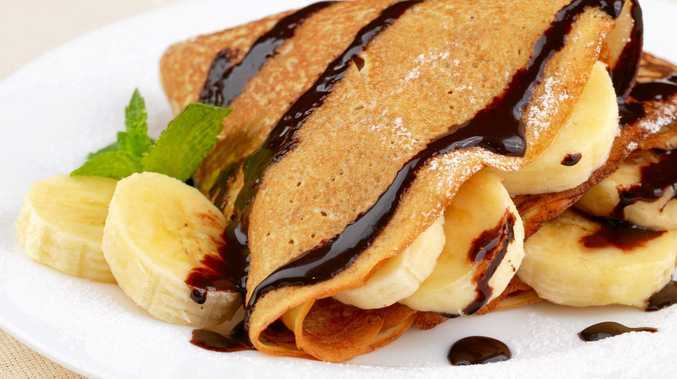 Slice bananas thinly and place on each crepe, folding to enclose the fruit. Dust with a little icing sugar, if desired, and drizzle with a little chocolate syrup. Serve immediately.